Note: The instructions on this page are for cell phones, pagers and other products placed near the body. Excluding extendable antenna masts, your product must be smaller than the AegisGuard™ XP Radiation Shield. Click here to download the instruction sheet included with Standard Models, or click here to download the instruction sheet included with Portable Computer, Radar Gun and Custom Length models. Both instruction sheets are in Adobe PDF format and require that Adobe Reader to be installed on your computer which can be downloaded from Adobe's web site at no charge. These models include VELCRO fasteners for easy installation. For specialized applications, cyanoacrylate, acrylic, epoxy, water based and other non-corrosive adhesives can be used to install the back of the Shield on various surfaces, or to permanently install a product to the front of the Shield. The following procedures can be used for any product smaller than the AegisGuard™ XP Radiation Shield (Shield). A randomly selected cellular phone is shown for illustration. To allow for product movement, trim to size or shape only if required to fit in the bottom of your pocket, pouch or purse, such as for pockets with a round or triangular bottom. It can be trimmed to size or shape using scissors, such as for pockets with a round or triangular bottom, or for pagers, necklace or wrist style body products. For pockets, cut the top of the Shield at least 1/2 in. (1.25 cm) longer than your wireless product and the width of your narrowest pocket. To allow for product movement in pouches and purses, trim to size only if it is too large. Trace your product on paper, adding at least 1/4 in. (7 mm) to all sides, and cut out the traced shape with scissors. Center cut tracing on the bottom of the Shield over the black label (front) and tape it to areas of the Shield that will be discarded after trimming (Figure 1). Carefully cut around tracing. The corners should be rounded to prevent fraying. Do not touch the adhesive on VELCRO fasteners. For small products such as child monitors and wrist communicators, cut the VELCRO Hook Strip 1/4 in. (7 mm) shorter than the length of your product. For products such as cellular phones, cut the VELCRO Hook Strip 1 in. (2.5 cm) shorter than the length of your product. Remove backing and center on the bottom front side of the Shield just above the black label (Figure 2). 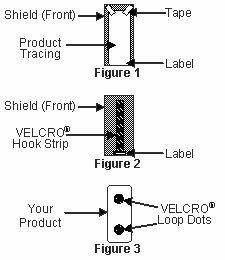 Remove backing from 1 VELCRO Loop Dot and place on the upper part of the back of your product in a position that will attach securely to the VELCRO® Hook Strip when the product is placed on the Shield. (Figure 3). Allow adhesive to set 24 hours. Center the back of your product on the Shield just above the bottom of the black label (front) and press lightly. To remove, hold the Shield with your thumb under an edge of your product and carefully lift the product away from the Shield. The AegisGuard™ XP Radiation Shield must be positioned between the phone and your body. Place it in your pocket, pouch or purse with the black label (front) facing away from you. Position the phone with an AegisGuard™ Phone and/or Headset Radiation Shield installed so that the front of the phone is facing the front of the AegisGuard™ XP Radiation Shield. The included VELCRO fasteners are not required for this application. Place the phone on the seat so that the front of the phone is facing the roof of the car. Then place the Shield over the phone with the black label facing the roof of the car. Do not allow the Shield to cover the extendable antenna mast if your phone has one. Gently wipe the front of the Shield with a damp sponge or soft cloth and allow to air dry. Do not clean the back of the Shield or use if wet. Do not use the Shield if it is wet, cut, torn or frayed. Corporate names, trademarks or registered trademarks on this page are the properties of their respective companies.